Sugar Free Cola Bottles Lollies made by Astra have an authentic nice cola flavour. Made in Belgium sugar free Cola Bottles are of an exceptional quality. Ingredients: Sweetener: Maltitol Syrup, Gelatine, Water, Acid:E330, Flavourings, Colours (E120), Nettle and Spinach Extract, Glazing Agents, Vegetable Oil, Beeswax, Carnauba wax. 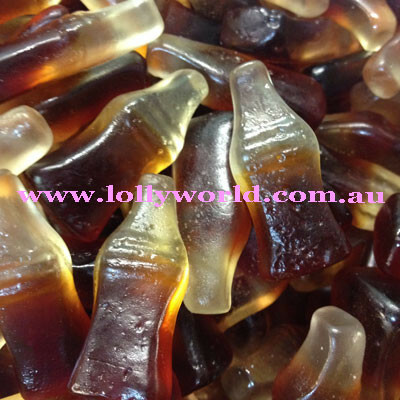 Sugar Free Cola Bottles Lollies made by Astra have an authentic cola flavour. Made in Belgium they are of an exceptional quality. Ingredients: Sweetener: Maltitol Syrup, Gelatine, Water, Acid:E330, Flavourings, Colours (E120), Nettle and Spinach Extract, Glazing Agents, Vegetable Oil, Beeswax, Carnauba wax.